Unlike other museum objects, the Museum of History and Folk Art of Rethymno is not directly under the tutelage of the Greek Ministry of Culture. Since 1974, when it was founded by Christophoros Stavroulakis and Wave G. Voyatzaki, it is a private non-profit organization that acquires the majority of exhibited items as its own purchases or gifts provided by private individuals. One of the main goals of this museum is to preserve the knowledge of Cretan culture and traditions with particular reference to those originating from the Rethymno prefecture. Before you enter the museum, it is worth paying attention to the building in which this museum operates, because it is an object located on the ministerial list of buildings constituting monuments of Greek history and is under permanent conservation protection. The museum complex occupies an area of ​​less than 1000 sq m. Inside the closed courtyard is a small internal garden that separates two buildings. Both buildings come from the 17th century and are examples of urban buildings characteristic of the end of Venetian rule in Crete. For the benefit of the museum, the building was donated by G. Voyatzaki. A thorough restaurant that restored the original appearance of this building was possible thanks to the support of the Greek National Tourism Organization (GNTO). The official opening of the museum took place in September 1998. In total, there are about 5,000 items in the collection of this small museum. This number is constantly changing, because for the museum are passed further interesting gifts that will certainly enrich future exhibitions. Objects presented in museum halls have been grouped according to several main categories. Strolling between the rooms you will have the opportunity to visit several thematic exhibitions. One of the most interesting is the room in which the atmosphere of the traditional shopping street of Rethymno has been recreated. If you know the book "Chronicles of a city" by Pandelis Prévélakis, it is thanks to this exhibition that you will be able to see what the city looked like in the times described by him. Among the small craft workshops that are currently in vain to find among the narrow streets of Rethymno, there was also a reconstruction of the former cafeteria. 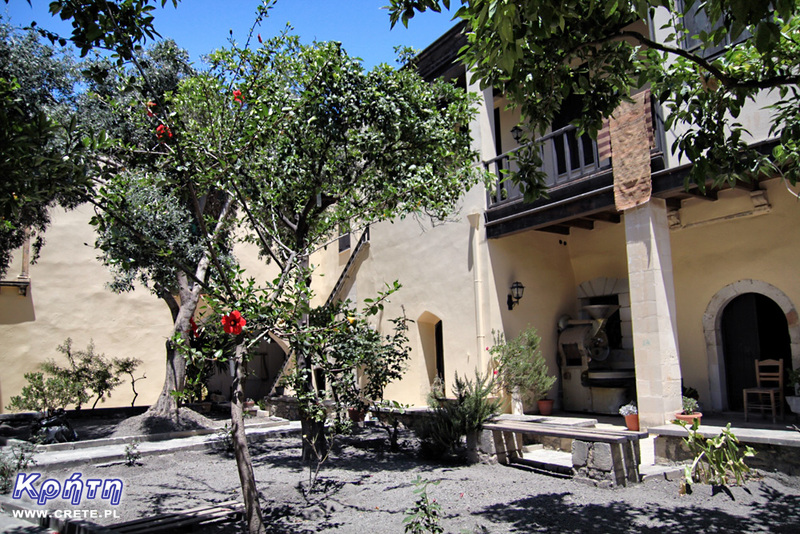 Exhibits presented by this museum are also a great way to see what the life of the old Cretans looked like. One of the expositions located on the upper floor is a faithful reflection of the interior of a traditional Cretan house. It is worth noting that the presented items are authentic equipment offered by one of the families living on the island. In the next exhibition rooms you will be able to find out how in the recent past looked like home baking, or how tedious and time-consuming activity was to make delicate lace. After such a "lesson" certainly more than one person will look a bit differently at the prices of products offered by local crafts. Many of the competitions and skills presented in this museum are those that already or at least in the near future can be considered from disappearing. Unfortunately, this is a completely natural and inevitable process that practically all communities experience. Hopes for folk art are young Cretans who are interested in cultivating traditions and skills inherited from their ancestors. Of course, currently they are usually not treated as the main source of income, and most often they are a hobby or a passion that makes pleasure. The museum is located in the very center of Rethymno, next to one of the main pedestrian streets. This area of ​​the city is a thicket, narrow, mostly one-way streets, where it is difficult to park a car. For this reason, we do not recommend driving a car in the immediate vicinity of the museum, and we recommend visiting it with a walking path to Rethymno. The exact address where the museum is located is Vernardou 30. It is open every day (except Sundays) from 10 a.m. to 2.30 p.m. The cost of the ticket is unfortunately not low and amounts to 4 €. After visiting the museum, we recommend visiting the Giorgos Hatziparashos plant, where the tradition of manual filo production is still cultivated. If you find the right place, you will be able to see a real spectacle, during which the cake of a kneaded dough turns into a huge, delicate piece of filo. Perhaps this incredible skill will also find its place in the neighboring museum. At the end, do not forget to stock up on some of the sweet delicacies produced in this place, it's not without exaggeration to write that you are "licking your fingers". The Archaeological Museum of Heraklion is one of the most important and largest museums in Greece and one of the most important in Europe. The permanent exhibition of the museum contains unique works of art and Cretan history from excavations from the central and eastern parts of the island. It covers all periods of Crete's history and prehistory from the 5,500 years range from the Neolithic to the Roman times.